Among the very many roster moves today also came the news that T.J. Lang, the 11th-year veteran offensive guard, has been officially released by the Detroit Lions. Lang, who was drafted by the Green Bay Packers in the fourth round of the 2009 NFL Draft, struggled to find his feet in his first few years in the league, and managed overall grades of 60.5 and 64.2, respectively, across a combined 431 offensive snaps in 2009 and 2010. However, with two years under his belt, Lang quickly established himself as one of the most reliable pass-protecting guards in the NFL. 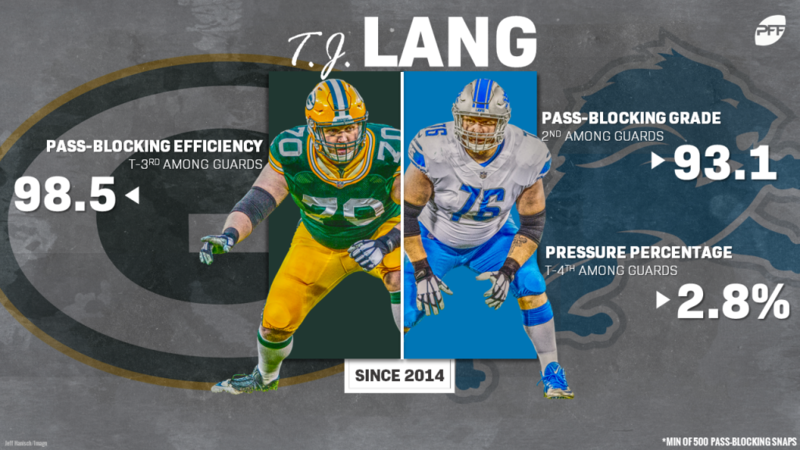 About as durable as they came, Lang played at least 900 snaps in each season from 2011 to 2016, and he recorded pass-blocking grades north of 75.0 in five of those six seasons. His career-best stretch came between 2015 and 2016, where he earned elite pass-blocking grades of 90.1 and 91.9, respectively, while he allowed a grand total of 31 total pressures on his combined 1299 pass-blocking snaps over that span. After he was allowed to test free agency, Lang eventually inked a three-year $28.5 million deal with the Detroit Lions before the 2017 season, and he seemingly picked up right where he left off in Green Bay. All told, he allowed just 17 pressures from his 479 pass-blocking assignments – but a number of injuries limited his season to only 809 snaps, his lowest single-season snap count since his sophomore year. Unfortunately for the veteran guard, things didn’t get much better from there. Battling to return from injury, Lang was forced to miss 10 games in 2018 with a neck issue, and ended up on injured reserve as a result. He played just 282 snaps in just six games with the team, but he was still his dominant self as a pass blocker, as he allowed just four total pressures from his 175 pass-blocking snaps en route to a pass-blocking grade of 86.5. If he can get healthy and return to his best, Lang would provide an instant upgrade to most lines in the NFL. He’s a player that has recorded pass-blocking grades of at least 80.0 in six of his 10 professional seasons, and pass-blocking grades of at least 85.0 in each of his last five. Since 2014, he’s allowed a total of just 72 pressures (and only seven sacks) on his 2568 pass-blocking snaps over that span, while his cumulative pass-blocking grade of 93.1, his pressure rate of 2.8%, and his pass-blocking efficiency of 98.5 rank second, third, and fourth among 133 offensive guards with at least 500 pass-blocking snaps in that span, respectively. Lang will now enter free agency with a decision to make. After missing extensive time through injury and suffering three concussions in the last two seasons, there could be a chance that Lang decides to hang up his cleats before the turn of the new league year. However, if he chooses to continue, offensive line-needy teams should carefully consider inking him to a deal.